Nauhaus, Busse, Carandini and Dario Ringach published an influential paper in 2009 with pretty convincing evidence that spikes trigger traveling waves of activity visible in LFPs; that these waves travel laterally; and because the dynamics of these waves change during stimulation compared to spontaneous activity, that stimulation modulates functional connectivity. This could imply that a single spike matters; it isn’t lost in a sea of spiking activity, but rather triggers secondary activity that is amplified in the network. These are exciting findings, but they have been controversial. They used a rather straightforward method of measuring these waves in a 10×10 Utah electrode array. They averaged the LFP measured on each electrode around the time of spikes on a triggering electrode (below). They then measured the position of the peak of the spike-triggered LFPs, and found that the relationship between electrode distance, strength of the triggered LFP, and temporal lag are all consistent with the notion that spikes trigger spreading waves of activation. As I reported a few months ago, Ray and Maunsell (2011) published a rebuttal, basically saying that the measured phenomenon is in fact a signal processing artifact. Their idea was that the spike-triggered LFP is a sum of two components: a fast one and a slow one. The fast one is caused by the spike waveform measured on the triggering and neighbouring electrodes, decays very fast with distance, and is centered around time zero. The second one is thought to be due to synchronization of spikes with certain phases of the LFP. On the triggering electrode, it should be the case that spikes tend to fire on certain low-frequency (< 10 Hz) LFP phases. Now, LFPs at such low frequencies are highly consistent across space. Thus, the spike-triggered LFP is in Ray and Maunsell’s theory a sum of a fast component which decays rapidly as a function of distance from the triggering electrode and a slow component which decays slowly. By low-pass filtering the spike-triggered LFP, then, the two components become blurred, and the resulting signal looks like a traveling wave if it happens that the slow peak occurs with respect to the fast peak (above). Ray and Maunsell’s data showed results which appear consistent with this theory. Nauhaus et al. just published a rebuttal of the Ray and Maunsell paper in the latest issue of the Journal of Neuroscience. They point out that for Ray and Maunsell’s explanations to really work, you need to low-pass filter at some excessive cutoff like 20 Hz, much lower than the one they used in the original paper (90Hz). They repeated the same analyses in the original paper using a very high cutoff (500Hz), and found results essentially equivalent to their original ones. They repeated this analysis on the unfiltered data published in Ray and Maunsell. Once again, they found clear evidence of a temporal shift in the slow peak of the spike-triggered LFP as a function of electrode position. 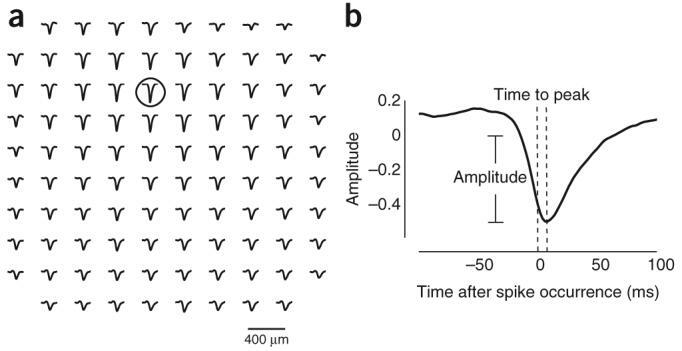 This is consistent with the idea that spikes trigger traveling waves of activity that spread across cortex. Disproving someone’s theory using his own dataset is pretty damn convincing. An important difference between Nauhaus and Maunsell’s data is that the fast, 0 ms transients spread over many more electrodes in Maunsell’s data than in Nauhaus. I have no ready explanation for that. Nauhaus et al. state that this could be due to different preparations (awake in Maunsell’s case, anesthetized in the other), but we have V4 data here from an awake preparation which looks a lot like the Nauhaus data. In the run-up to writing Zanos, Mineault and Pack (2011), we contemplated whether the spike artifact in the spike-triggered LFP could explain some puzzling findings in the literature. Now we looked at a lot of different scenarios, and in the end we found that to get a significant artifactual peak at 0 ms you need to pick up the spike waveform directly on that electrode. So if neuron 1 on electrode A drives neuron 2 on electrode B, that has little effect on the LFP on electrode B triggered on the spike times of neuron 1. Now, it is entirely possible to pick up a neuron on two electrodes if they’re close enough, and we occasionally get this in our preparation, but with a Utah array the electrodes are spaced sufficiently far apart (400 microns) that this is quite rare. So I can’t see why the 0 ms peak should be so large on non-triggering electrodes in Ray and Maunsell. Now, that doesn’t disprove the important point that Ray and Maunsell made in their paper, that you have to be extra careful about signal processing with LFPs because they accumulate a lot of garbage. I wholeheartedly agree. At the same time, I think that it’s unlikely that a single spike can trigger a measurable spread of activity across a slab of cortex. I think a more reasonable explanation involves correlated network states spreading rather than the spikes themselves. Maybe that’s splitting hairs, I don’t know. Do Ray and Maunsell say what is that they use as a reference in their manuscript? Could be. The weird thing is that the fast component measured on the non-trigger electrodes is very similar to the one on the trigger electrode, only smaller in amplitude. However, if you assume that the fast component on the non-trigger electrodes is due to the triggering neuron being correlated with foreground neurons on the non-trigger electrodes, then the fast component should be a lot more smeared in time, wider in addition to being smaller. The reason is that the correlation can’t be that high, and any jitter in the correlation should smear the fast component. Thus, I have a hunch that the fast component on the non-trigger electrodes is an artifact of multiple electrodes being triggered by the same signal. It could very well be, as you suggest, that this is due to using a reference wire which has spikes on it.